This exceptionally grand piece Grandes Armories tapestry was originally woven by the Gobelins manufactory in the 18th century in France. Designed by Pierre Josse Perrot, the original Gobelins tapestry was produced to announce the reign of Louis XV who came to reign as a five year old in the year 1715. The 3 fleurs de lis symbols in the azure blue cartouche represent the arms of France below the golden crown. The sceptre, armory and swords and elaborate ornaments is symbolic of the king's power and reign. The extreme intricacy and richness of detail in this tapestry from the cloak behind the cartouche to the acanthus foliage and regal armor makes this tapestry one of the most impressive in French tradition. There were over 20 versions of this tapestry made over a period of 15 years and one of these adorns the door of a chamber at Versailles, and are also used by French ambassadors to decorate their embassies. This impressive coat of arms tapestry will make a magnificent impression in any room or home. 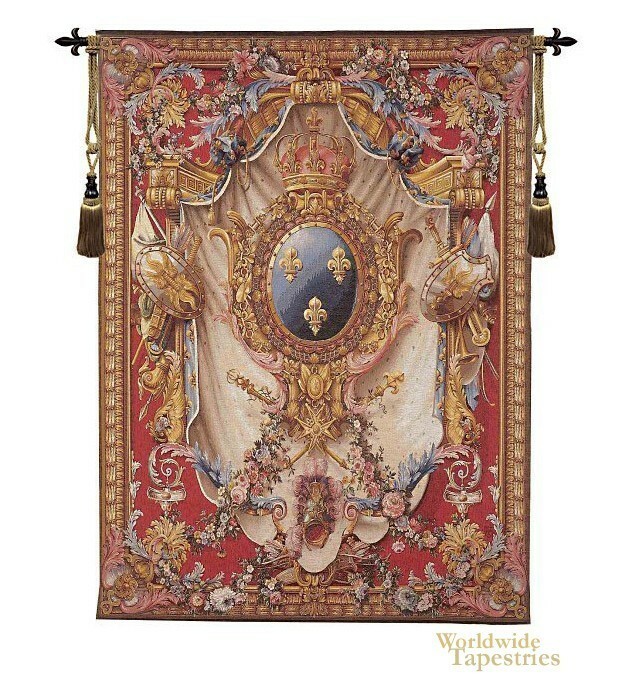 This "Grandes Armories" tapestry is backed with lining and a tunnel for ease of hanging. Note: tapestry rod, tassels, and accessories, where pictured, are not included in the price.